There’s something about rocking this fedora and these sunnies that gives me an extra boost of confidence- a lil’ style magic! Few things beat the rustic colors, smells of pumpkin flavored everything, apple-cinnamon pie, and piping hot- straight from the oven butternut squash casserole that comes hand-in-hand with fall fashion must-haves. There’s something really romantic about the smell of the rain on a crisp fall evening, as is, lighting the fireplace for the first time of the season. There’s the much-anticipated task of transitioning our summer wardrobe into the perfect fall outfits. Then there’s the big question, what fashion pieces will seamlessly transition you from summer into fall; and what staple pieces or seasonal fashion trends you’ll be adding for a boast of zest in your life? Y’all already know what a few amazing new fashion finds will do for both, a girls wardrobe and confidence! With summer behind us, its time to tackle changing our closets out, preparing for the fun of layering, new fashion ideas; and of course, planning a brandistas shopping day- to snag a few pieces with your besties approval. If you’re like me, once you’ve drooled over the amazing new colors, fashion trends, and fabrics from the runways- you’re left to transition that inspiration into staple pieces that’ll work for your own personal style, needs, and budget. Here’s how I approach tackling my transition and must-haves for the new season. 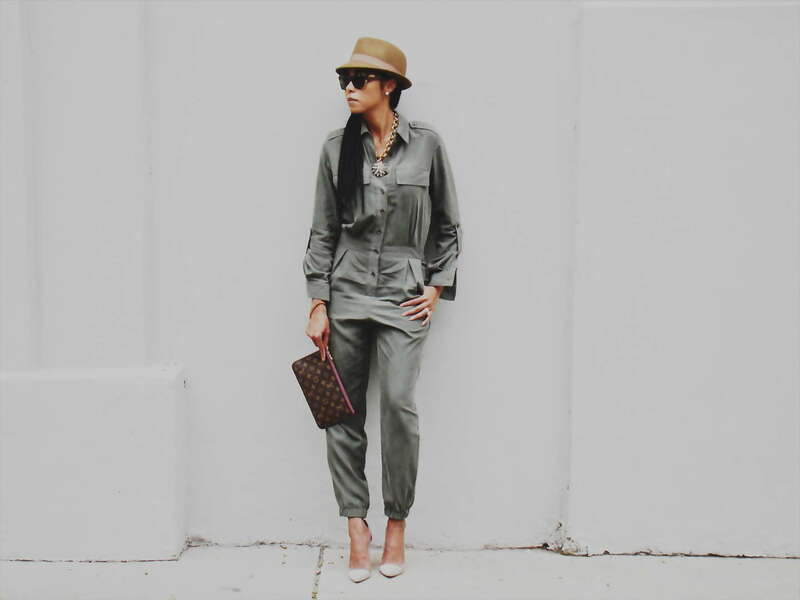 First, the old faithful, one-and-done jumpsuit offers optimal versatility. Perfect for a casual day with a nice flat or heeled bootie, or a glamorous night with a well-heeled pumped. 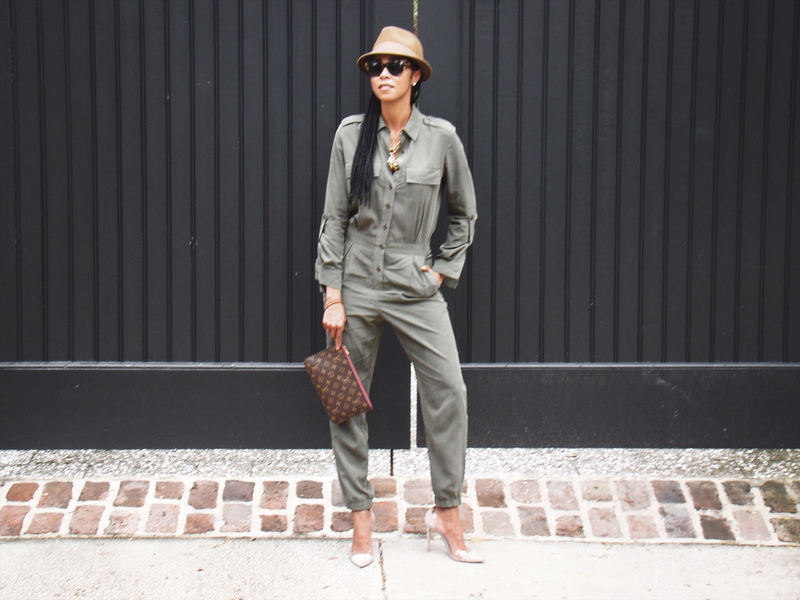 Jumpsuits have earned their keep as my favorite, in a rush, don’t have much time to pull myself together but still need to feel stylish on the go. The season offers the one piece in a variety of rich fall colors, fabrics, and fits. I went with a longer length cut than last season’s ankle length version, in one of the season’s must-have- olive green. This jumpsuit (my ootd) has a slightly fitted through the bodice and tailored at the waist cut, which is pretty flattering. 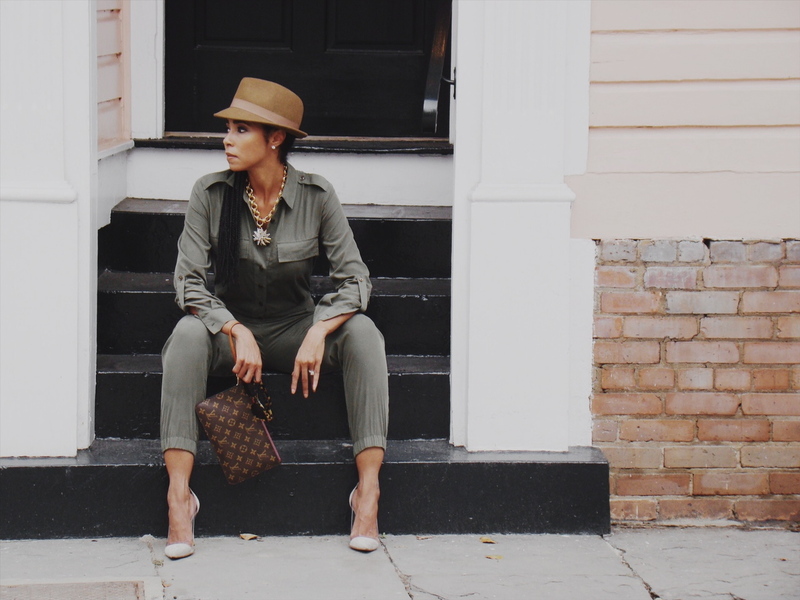 I love the way it flows with my body, jumpsuits this season come in an array of styles and the season’s hottest fall clothing colors (think navy – (I just snagged) army green, and yellow) are everywhere. With the right fit and a color you adore, it’ll definitely earn its keep in your wardrobe for a season or two. Next, there’s searching out the perfect pair of fall sunnies. I like lighter frame aviators during the summer months and I wore those suckers out, but my smaller (like kid-sized) head makes finding a great fit challenging. I sought out a bulkier style with a different squarer shape from the aviators that’ll take me through the winter. After trying close to ten pairs, I choose a camel tortoiseshell style (snag a similar pair here). While I don’t subscribe to the science behind which shape of glasses looks best on various face shapes, it suggests, if you have a square face you should opt for glasses with softer, round edges to balance out your features. For a round face, you’d go for a more angular frame. For heart-shaped faces consider aviators, rounds, and small thinner frame styles, while oval-shaped faces can pretty much rock what they want due to their balanced facial symmetry. Anywho, beyond the rules of scale if you subscribe, find a pair you absolutely love- that fit, are made from a durable material and with a design that complements your personal style. With these three fall fashion must-haves on deck, you’re on your way to a great foundation to showcase your personal style and having way too much fun rocking out your fall outfits! subscribing for your feed and I’m hoping you write once again immediately! You are looking absolutely fantastic in this outfit! I love your jumpsuit! 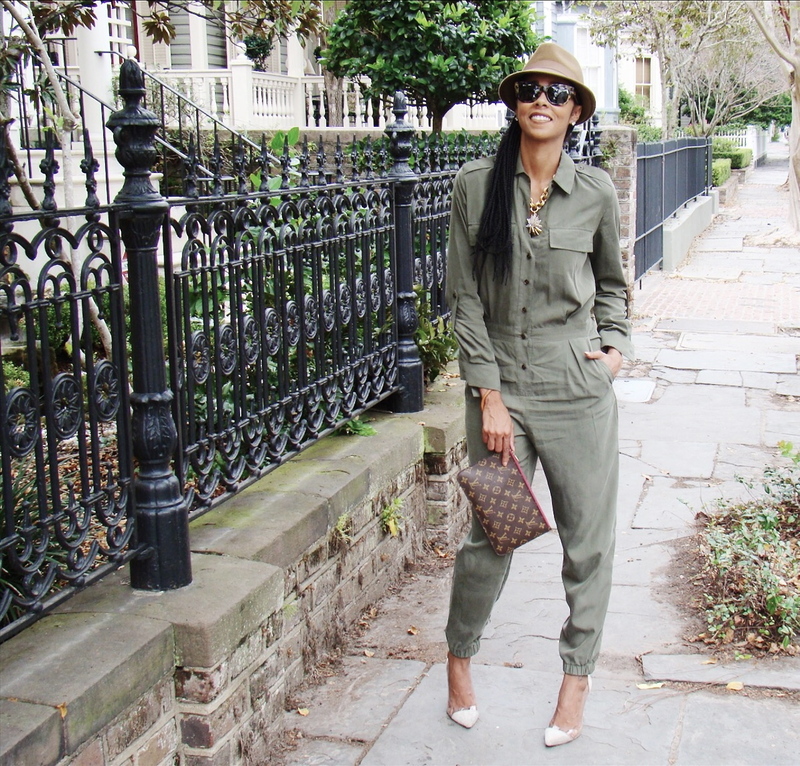 Loving the military/fighter pilot vibe from that jumpsuit! And that hat really adds a nice touch of sophistication to it all.